Matt Wood heads for Italy to try out the latest gear from Iveco. It’s hard to talk about Italy without talking about food. It’s doubly hard when the reason that you are there in the first place has nothing to do with food whatsoever. But food was nonetheless on my mind as I stood trackside at Fiat’s Balocco proving ground just out of Turin in northern Italy. Under the Italian summer sun my stomach was in rapturous turmoil after an amazing lunch that consisted of porcini mushrooms and sheep’s cheese followed by a salted fillet of veal with aromatic herbs and vegetables au gratin. I clearly needed another espresso, but I tried to concentrate anyway as I contemplated my first real hands-on look at the Euro 6 Iveco Stralis Hi-Way. 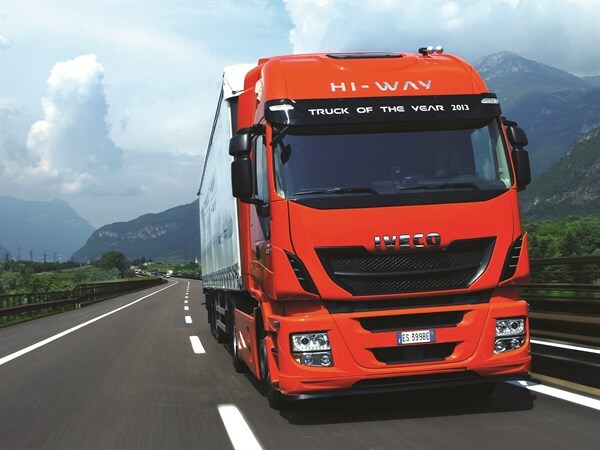 The new Iveco Stralis was unveiled at the 2012 Hanover International Motor Show for Commercial Vehicles (IAA) in Germany two years ago and it quickly went on to be voted 2013 European Truck of the Year by a bunch of journos on the continent. This was largely due to Iveco’s ability to meet new Euro 6 emissions standards by using selective catalytic reduction (SCR) only. Iveco Australia has only recently confirmed that, like many of its European counterparts, the company will be bringing Euro 6 power plants into Australia in the near future to complement the existing Euro 5 range. However, the truck before me was a typically continental set-up, a short wheelbase 4x2 prime mover and tri-axle trailer all pinched up to fit inside the European Union 16.5m length limit for trucks. Under the big Iveco Stralis cab was an 11-litre Hi-eSCR 460hp (343kW) Euro 6 Cursor 11 engine. It may be a new engine but it still retains the peaky characteristics of its older Cursor predecessors which became clearer by the second as it worked its way up through the gearbox. Mainland European operators can run at 44 tonnes as a single trailer combination, while the United Kingdom knocks that back to 40 tonnes. 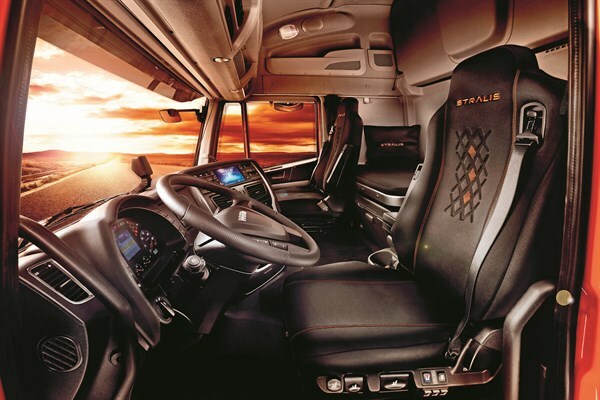 This Stralis was weighing in at the 40-tonne mark. The Euro 6 Cursor 11 engine is run by a 12-speed Eurotronic automated manual transmission (AMT). Of course being in Italy meant I had to climb into the cab from the left to get behind the wheel, but it wasn’t long before I was settled and ready for a squirt around the Balocco track. But not before another espresso. With thoughts of last night’s potato gateau with truffle scented buffalo’s milk still swirling through my senses and an espresso in my hand, I had a chance to look at Iveco’s new telematics solution Ivecoconnect. Unfortunately telematics as a subject does seem to have the effect of putting people to sleep, so it’s wasn’t the easiest topic to tackle on a full stomach. But I did get to look at the 7-inch (18cm) Iveconnect touchscreen in the Stralis I drove. I was even logged into the system to enable me to monitor my driving performance in a very similar fashion to the system built into Scania’s vehicles. The Iveconnect unit also acts as an infotainment system and can provide truck specific navigation as well. My driving score was a rather ordinary 88 per cent, but I’m going to blame the lost points on being on the wrong side of the cab while I was driving. As you’d expect from a telematics system these days, real-time tracking and vehicle monitoring are featured in this system as well as reporting fatigue-related incidents and driver monitoring. The driver interface with its ranking system called Driver Style Evaluation (DSE) allows the driver to immediately see the results from improved driving behaviour. If used in Iveconnect Fleet guise, information can also be seen back at the depot to monitor performance economy and behaviour. This system has come about as a result of a partnership between telematics supplier Omnitracs and Iveco. 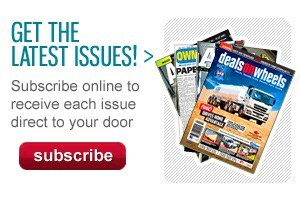 It’s only available on Euro 6 vehicles at this stage with no scope to retrofit older models. The potential for this system is again most likely to be fully realised on the European market, as one of the more striking features of the Omnitracs-Iveco system is the ability to download driving hours data from individual vehicles. The telemetrics system can interact with the digital tachograph in the truck. 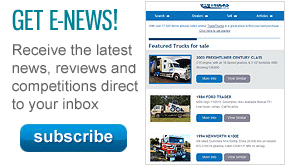 On a big fleet scale this could make compliance monitoring a much easier task. It’s been a long time since I’ve driven a 4x2 prime mover; in fact the last one I did drive would have been an International S-Line 3600. It seemed strange to be driving what is essentially a supermarket delivery truck in Australian terms but with a long distance sleeper cab and double bunks. In comparison to the traditional Aussie 6x4, the 4x2 Iveco Stralis Hi-Way seemed a bit twitchy on the road, and the cab suspension was in a soggier state of tune than what would normally appear on our shores. However, the Cursor did a surprising job of pulling the rig up to speed and holding it at the European limit of 90km/h. But my attention was soon drawn to the gorgeously infernal howl of two Maserati Quattroporte’s circling the neighbouring track at high speed. It was very distracting. There is a slight coarseness to the Cursor’s exhaust note which is another characteristic that carries on through the Cursor family. But the retardation offered by the Intarder engine brake was exceptionally good, especially given the modest size of the engine. To date, this is the only Euro 6 engine I’ve driven so I don’t have much of a yard-stick to draw on to compare it to as far as its competitors go. During my drive a yellow ‘T’ warning light kept flashing on the instrument panel. This was to warn me I didn’t have my card in the truck’s digital tachograph unit. A hint of what the future may hold in Australia one day, maybe. Unfortunately my time behind the wheel of the Stralis was all too brief but it was certainly enough to pique my interest in what lies ahead not only for Iveco product in Australia but in other future European vehicles as well. My Stralis Hi-Way was neatly pinched up to its trailer to maximise aerodynamics and minimise disruption to air flow between the truck and trailer. In Australia, however, this would knock our 6.5 tonne Mass Management steer axle weight limit out of the ball park. In short, European truck makers, such as Iveco, can spend lots of money making slippery shaped trucks to maximise fuel economy, yet here in Oz we don’t get to reap the rewards of these advancements. The Iveco Stralis comes into Australia completely built-up (CBU) while its bonneted sibling the Powerstar and the vocational ACCO are manufactured in Australia at the company’s Dandenong, Victoria site. The Euro 6 Stralis does have a weight advantage over its competitors which may stand it in good stead with Australian operators. The lack of an exhaust gas recirculation (EGR) system and the resulting lack of complexity in the cooling system means a significant steer axle weight advantage over other makes when and if Euro 6 (ADR80/04) does come into force in Australia. But startlingly, my diet while travelling in Italy has also had the unfortunate effect of making sure every truck I drive over the next few weeks will be way too heavy over the steer axle. But hey, the panna cotta was worth it. However, it would be remiss of me to not to mention the mille-feuille with verveine custard and wild strawberries, as well. 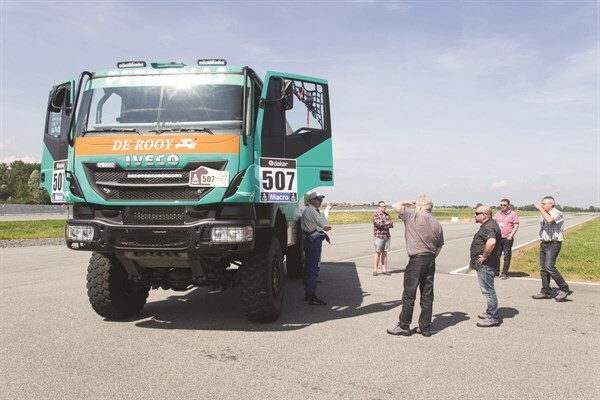 In between the telemetry and playing with large orange trucks, I did have the chance to take a close look at one of Gerard De Rooy’s Iveco Trakker Dakar trucks. One of the De Rooy team’s test drivers was on-hand to show me that you can indeed get 850hp (634kW) and 3,800Nm of torque out of a Cursor engine. The thing bloody flew and sounded exceptionally good while doing it I might add. There’s nothing like the smell of burning rubber along with the roar of a large capacity diesel engine through a competition exhaust system. A delightful risotto al prosecco pere e maggiorana may be enough to have some contemplating gas from a different perspective. But Iveco has become the first commercial vehicle manufacturer in the world to offer natural gas across its range from light-duty to medium- and heavy-duty. The company uses a stoichiometric spark ignition compressed natural gas (CNG) system for its van and truck range. From an Australian perspective, the CNG system would seem to have the most potential in the Iveco Daily van and cab-chassis where range, refuelling and weights weren’t so much of an issue. The CNG Stralis has a maximum power rating of 330hp (246kW) for the gas breathing 8-litre Cursor which limits its potential somewhat in Australia. National Key Account Manager for Iveco Australia Lloyd Reeman confirmed however the company is seriously considering its CNG options for Australia and would be watching market demand for these vehicles as well as the development of refuelling infrastructure.